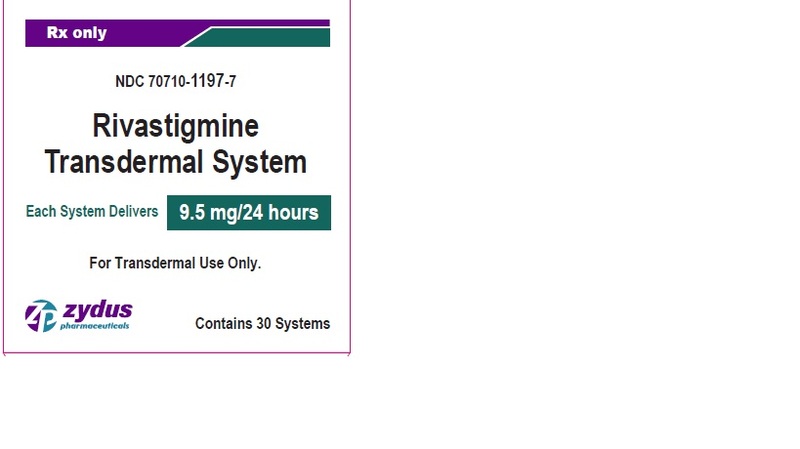 Proprietary Name: Rivastigmine What is the Proprietary Name? Non-Proprietary Name: Rivastigmine What is the Non-Proprietary Name? 70710 - Zydus Pharmaceuticals (usa) Inc.
Rivastigmine with NDC 70710-1196 is a a human prescription drug product labeled by Zydus Pharmaceuticals (usa) Inc.. The generic name of Rivastigmine is rivastigmine. The product's dosage form is patch, extended release and is administered via transdermal form. Labeler Name: Zydus Pharmaceuticals (usa) Inc.
FDA Application Number: ANDA206318 What is the FDA Application Number? Rivastigmine transdermal system is indicated for the treatment of dementia of the Alzheimer's type (AD). Efficacy has been demonstrated in patients with mild, moderate, and severe Alzheimer's disease. Rivastigmine transdermal system is indicated for the treatment of mild-to-moderate dementia associated with Parkinson's disease (PDD). 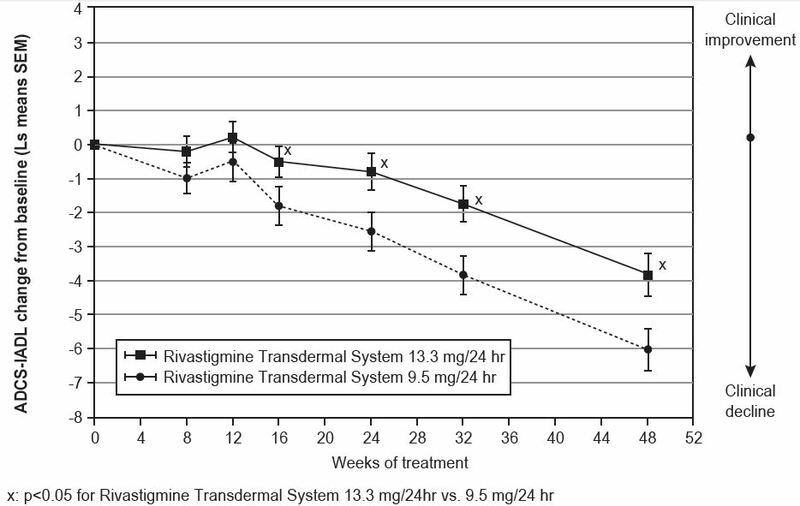 Initial DoseInitiate treatment with one 4.6 mg/24 hours rivastigmine transdermal system applied to the skin once daily [see Dosage and Administration (2.4)].Dose TitrationIncrease the dose only after a minimum of 4 weeks at the previous dose, and only if the previous dose has been tolerated. For mild-to-moderate AD and PDD patients, continue the effective dose of 9.5 mg/24 hours for as long as therapeutic benefit persists. Patients can then be increased to the maximum effective dose of 13.3 mg/24 hours dose. 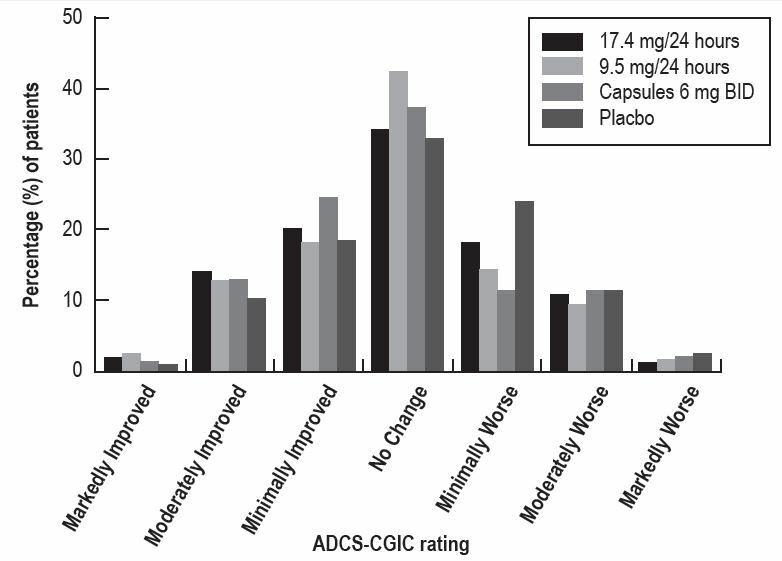 For patients with severe AD, 13.3 mg/24 hours is the effective dose. Doses higher than 13.3 mg/24 hours confer no appreciable additional benefit, and are associated with an increase in the incidence of adverse reactions [see Warnings and Precautions (5.2), Adverse Reactions (6.1)].Mild-to-Moderate Alzheimer's Disease and Mild-to-Moderate Parkinson's Disease DementiaThe effective dosage of rivastigmine transdermal system is 9.5 mg/24 hours or 13.3 mg/24 hours administered once per day; replace with a new transdermal system every 24 hours.Severe Alzheimer's DiseaseThe effective dosage of rivastigmine transdermal system in patients with severe Alzheimer's disease is 13.3 mg/24 hours administered once per day; replace with a new transdermal system every 24 hours.Interruption of TreatmentIf dosing is interrupted for 3 days or fewer, restart treatment with the same or lower strength rivastigmine transdermal system. 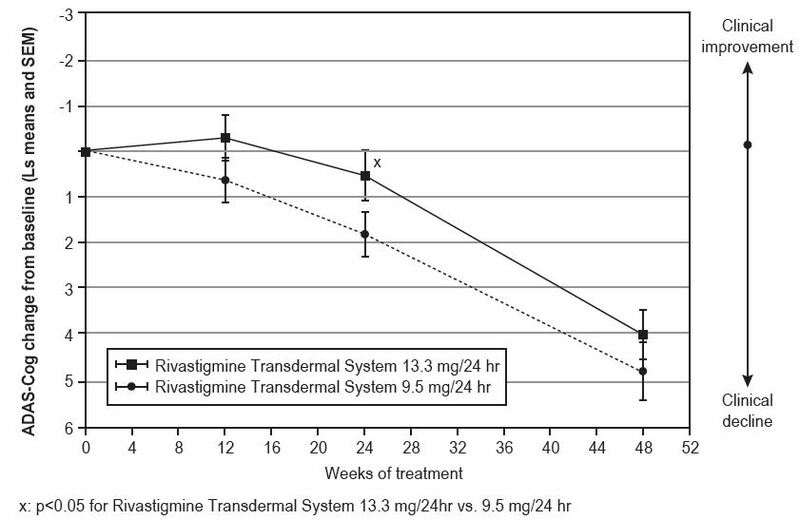 If dosing is interrupted for more than 3 days, restart treatment with the 4.6 mg/24 hours rivastigmine transdermal system and titrate as described above. Dosing Modifications in Patients with Hepatic ImpairmentConsider using the 4.6 mg/24 hours rivastigmine transdermal system as both the initial and maintenance dose in patients with mild (Child-Pugh score 5 to 6) to moderate (Child-Pugh score 7 to 9) hepatic impairment [see Use in Specific Populations (8.6), Clinical Pharmacology (12.3)].Dosing Modifications in Patients with Low Body WeightCarefully titrate and monitor patients with low body weight (less than 50 kg) for toxicities (e.g., excessive nausea, vomiting), and consider reducing the maintenance dose to the 4.6 mg/24 hours rivastigmine transdermal system if such toxicities develop. Patients treated with rivastigmine capsules or oral solution may be switched to rivastigmine transdermal system as follows: A patient who is on a total daily dose of less than 6 mg of oral rivastigmine can be switched to the 4.6 mg/24 hours rivastigmine transdermal system. A patient who is on a total daily dose of 6 mg to 12 mg of oral rivastigmine can be switched to the 9.5 mg/24 hours rivastigmine transdermal system.Instruct patients or caregivers to apply the first transdermal system on the day following the last oral dose. 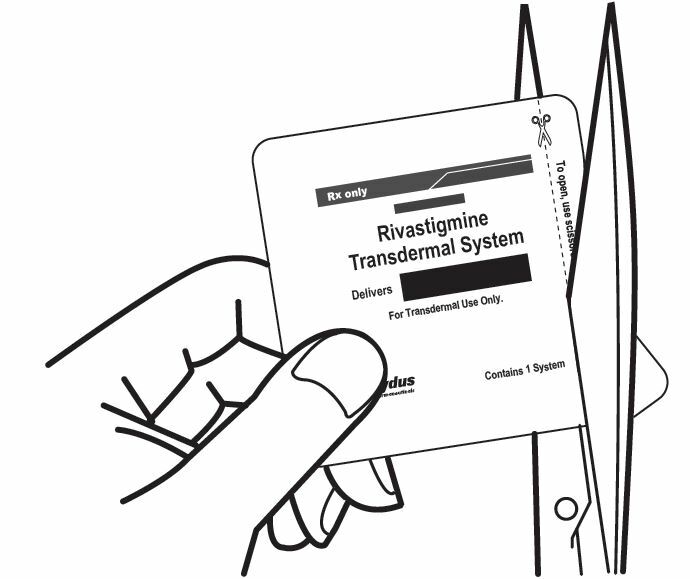 Rivastigmine transdermal system is for transdermal use on intact skin.a) Do not use the transdermal system if the pouch seal is broken or the transdermal system is cut, damaged, or changed in any way.b) Apply the rivastigmine transdermal system once a day. Press down firmly for 30 seconds until the edges stick well when applying to clean, dry, hairless, intact healthy skin in a place that will not be rubbed against by tight clothing. 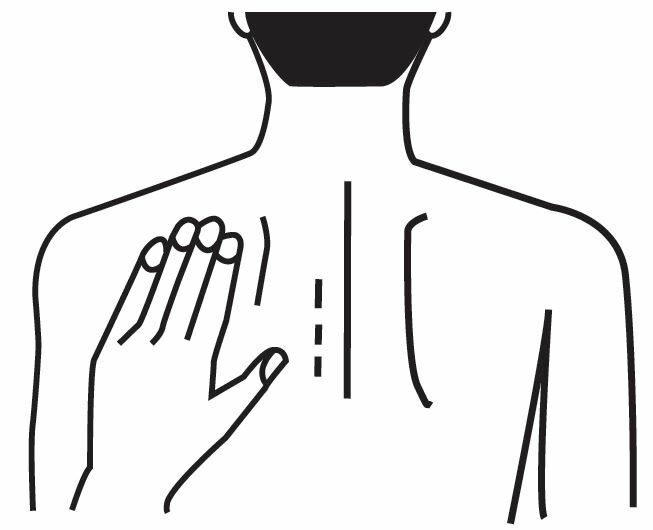 Use the upper or lower back as the site of application because the transdermal system is less likely to be removed by the patient. 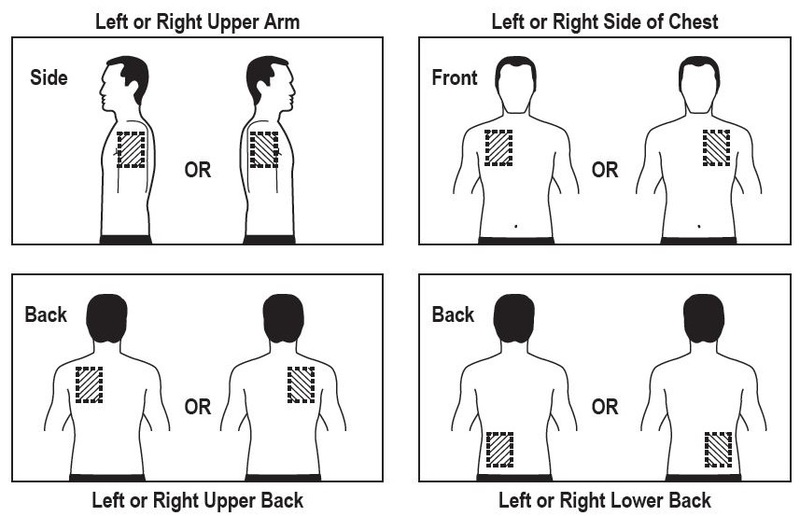 If sites on the back are not accessible, apply the transdermal system to the upper arm or chest. Do not apply to a skin area where cream, lotion, or powder has recently been applied.c) Do not apply to skin that is red, irritated, or cut.d) Replace the rivastigmine transdermal system with a new transdermal system every 24 hours. Instruct patients to only wear 1 transdermal system at a time (remove the previous day's transdermal system before applying a new transdermal system) [see Warnings and Precautions (5.1), Overdosage (10)]. 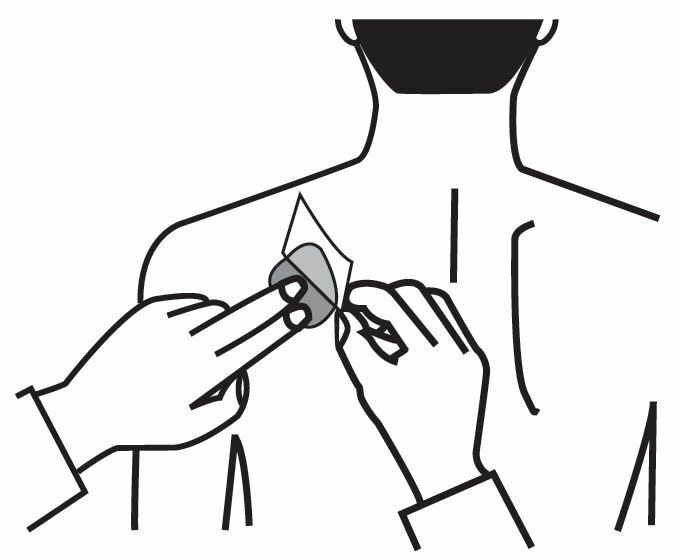 If a transdermal system falls off or if a dose is missed, apply a new transdermal system immediately and then replace this transdermal system the following day at the usual application time.e) Change the site of transdermal system application daily to minimize potential irritation, although a new transdermal system can be applied to the same general anatomic site (e.g., another spot on the upper back) on consecutive days. Do not apply a new transdermal system to the same location for at least 14 days.f) May wear the transdermal system during bathing and in hot weather. But avoid long exposure to external heat sources (excessive sunlight, saunas, solariums).g) Place used transdermal systems in the previously saved pouch and discard in the trash, away from pets or children.h) Wash hands with soap and water after removing the transdermal system. In case of contact with eyes or if the eyes become red after handling the transdermal system, rinse immediately with plenty of water, and seek medical advice if symptoms do not resolve. Rivastigmine transdermal system is available in 3 strengths. Each transdermal system has a beige backing layer labeled as either: Rivastigmine transdermal system 4.6 mg/24 hours, "Rivastigmine Transdermal System 4.6 mg/24 hours" Rivastigmine transdermal system 9.5 mg/24 hours, "Rivastigmine Transdermal System 9.5 mg/24 hours" Rivastigmine transdermal system 13.3 mg/24 hours, "Rivastigmine Transdermal System 13.3 mg/24 hours"
Rivastigmine transdermal system is contraindicated in patients with: known hypersensitivity to rivastigmine, other carbamate derivatives, or other components of the formulation [see Description (11)] . previous history of application site reactions with rivastigmine transdermal system suggestive of allergic contact dermatitis [see Warnings and Precautions (5.3)] .Isolated cases of generalized skin reactions have been described in postmarketing experience [see Adverse Reactions (6.2)]. The following adverse reactions are described below and elsewhere in the labeling: Gastrointestinal Adverse Reactions [see Warnings and Precautions (5.2)]. Skin Reactions [see Warnings and Precautions (5.3)]. Other Adverse Reactions from Increased Cholinergic Activity [see Warnings and Precautions (5.4)]. Medication errors with rivastigmine transdermal system have resulted in serious adverse reactions; some cases have required hospitalization, and rarely, led to death. The majority of medication errors have involved not removing the old transdermal system when putting on a new one and the use of multiple transdermal systems at one time.Instruct patients and their caregivers on important administration instructions for rivastigmine transdermal system. [see Dosage and Administration (2.4)]. Rivastigmine transdermal system can cause gastrointestinal adverse reactions, including significant nausea, vomiting, diarrhea, anorexia/decreased appetite, and weight loss. Dehydration may result from prolonged vomiting or diarrhea and can be associated with serious outcomes. The incidence and severity of these reactions are dose-related [see Adverse Reactions (6.1)]. For this reason, initiate treatment with rivastigmine transdermal system at a dose of 4.6 mg/24 hours and titrate to a dose of 9.5 mg/24 hours and then to a dose of 13.3 mg/24 hours, if appropriate [see Dosage and Administration (2.1)].If treatment is interrupted for more than 3 days because of intolerance, reinitiate rivastigmine transdermal system with the 4.6 mg/24 hours dose to reduce the possibility of severe vomiting and its potentially serious sequelae. A postmarketing report described a case of severe vomiting with esophageal rupture following inappropriate reinitiation of treatment of an oral formulation of rivastigmine without retitration after 8 weeks of treatment interruption.Inform caregivers to monitor for gastrointestinal adverse reactions and to inform the physician if they occur. It is critical to inform caregivers that if therapy has been interrupted for more than 3 days because of intolerance, the next dose should not be administered without contacting the physician regarding proper retitration. Skin application site reactions may occur with rivastigmine transdermal system. These reactions are not in themselves an indication of sensitization. However, use of rivastigmine transdermal system may lead to allergic contact dermatitis.Allergic contact dermatitis should be suspected if application site reactions spread beyond the transdermal system size, if there is evidence of a more intense local reaction (e.g., increasing erythema, edema, papules, vesicles) and if symptoms do not significantly improve within 48 hours after transdermal system removal. In these cases, treatment should be discontinued [see Contraindications (4)].In patients who develop application site reactions to rivastigmine transdermal system, suggestive of allergic contact dermatitis and who still require rivastigmine, treatment should be switched to oral rivastigmine only after negative allergy testing and under close medical supervision. It is possible that some patients sensitized to rivastigmine by exposure to rivastigmine transdermal system may not be able to take rivastigmine in any form.There have been isolated postmarketing reports of patients experiencing disseminated allergic dermatitis when administered rivastigmine irrespective of the route of administration (oral or transdermal). In these cases, treatment should be discontinued [see Contraindications (4)]. Patients and caregivers should be instructed accordingly. Neurologic EffectsExtrapyramidal Symptoms: Cholinomimetics, including rivastigmine, may exacerbate or induce extrapyramidal symptoms. Worsening of parkinsonian symptoms, particularly tremor, has been observed in patients with dementia associated with Parkinson's disease who were treated with rivastigmine capsules.Seizures: Drugs that increase cholinergic activity are believed to have some potential for causing seizures. However, seizure activity also may be a manifestation of Alzheimer's disease.Peptic Ulcers/Gastrointestinal BleedingCholinesterase inhibitors, including rivastigmine, may increase gastric acid secretion due to increased cholinergic activity. Monitor patients using rivastigmine transdermal system for symptoms of active or occult gastrointestinal bleeding, especially those at increased risk for developing ulcers, e.g., those with a history of ulcer disease or those receiving concurrent nonsteroidal anti-inflammatory drugs (NSAIDs). Clinical studies of rivastigmine have shown no significant increase, relative to placebo, in the incidence of either peptic ulcer disease or gastrointestinal bleeding.Use with AnesthesiaRivastigmine, as a cholinesterase inhibitor, is likely to exaggerate succinylcholine-type muscle relaxation during anesthesia.Cardiac Conduction EffectsBecause rivastigmine increases cholinergic activity, use of the rivastigmine transdermal system may have vagotonic effects on heart rate (e.g., bradycardia). The potential for this action may be particularly important in patients with sick sinus syndrome or other supraventricular cardiac conduction conditions. In clinical trials, rivastigmine was not associated with any increased incidence of cardiovascular adverse events, heart rate or blood pressure changes, or electrocardiogram (ECG) abnormalities.Genitourinary EffectsAlthough not observed in clinical trials of rivastigmine, drugs that increase cholinergic activity may cause urinary obstruction.Pulmonary EffectsDrugs that increase cholinergic activity, including rivastigmine transdermal system should be used with care in patients with a history of asthma or obstructive pulmonary disease. Dementia may cause gradual impairment of driving performance or compromise the ability to use machinery. The administration of rivastigmine may also result in adverse reactions that are detrimental to these functions. During treatment with rivastigmine transdermal system, routinely evaluate the patient's ability to continue driving or operating machinery. Because clinical trials are conducted under widely varying conditions, adverse reaction rates observed in the clinical trials of a drug cannot be directly compared to rates in the clinical trials of another drug and may not reflect the rates observed in practice.Rivastigmine transdermal system has been administered to 4516 patients with Alzheimer's disease during clinical trials worldwide. Of these, 3005 patients have been treated for at least 26 weeks, 1771 patients have been treated for at least 52 weeks, 974 patients have been treated for at least 78 weeks, and 24 patients have been treated for at least 104 weeks.Mild-to-Moderate Alzheimer's Disease24-Week International Placebo-Controlled Trial (Study 1)Most Common Adverse ReactionsThe most common adverse reactions in patients administered rivastigmine transdermal system in Study 1 [see Clinical Studies (14)], defined as those occurring at a frequency of at least 5% in the 9.5 mg/24 hours rivastigmine transdermal system arm and at a frequency at higher than in the placebo group, were nausea, vomiting, and diarrhea. These reactions were dose-related, with each being more common in patients using the unapproved 17.4 mg/24 hours rivastigmine transdermal system than in those using the 9.5 mg/24 hours rivastigmine transdermal system.Discontinuation RatesIn Study 1, which randomized a total of 1195 patients, the proportions of patients in the rivastigmine transdermal system 9.5 mg/24 hours, rivastigmine capsules 6 mg twice daily, and placebo groups who discontinued treatment due to adverse events were 10%, 8% and 5%, respectively.The most common adverse reactions in the rivastigmine transdermal system-treated groups that led to treatment discontinuation in this study were nausea and vomiting. The proportions of patients who discontinued treatment due to nausea were 0.7%, 1.7%, and 1.3% in the rivastigmine transdermal system 9.5 mg/24 hours, rivastigmine capsules 6 mg twice daily, and placebo groups, respectively. The proportions of patients who discontinued treatment due to vomiting were 0%, 2.0%, and 0.3% in the rivastigmine transdermal system 9.5 mg/24 hours, rivastigmine capsules 6 mg twice daily, and placebo groups, respectively.Adverse Reactions Observed at an Incidence of Greater Than or Equal to 2%Table 1 lists adverse reactions seen at an incidence of greater than or equal to 2% in either rivastigmine transdermal system-treated group in Study 1 and for which the rate of occurrence was greater for patients treated with that dose of rivastigmine transdermal system than for those treated with placebo. The unapproved 17.4 mg/24 hours rivastigmine transdermal system arm is included to demonstrate the increased rates of gastrointestinal adverse reactions over those seen with the 9.5 mg/24 hours rivastigmine transdermal system.Table 1Proportion of Adverse Reactions (ARs) Observed with a Frequency of Greater Than or Equal to 2% and Occurring at a Rate Greater Than Placebo in Study 1 Rivastigmine Transdermal System 9.5 mg/24 hours Rivastigmine Transdermal System 17.4 mg/24 hours Rivastigmine Capsule 6 mg twice daily Placebo Total Patients Studied 291 303 294 302 Total Percentage of Patients with ARs (%) 51 66 63 46 Nausea 7 21 23 5 Vomiting* 6 19 17 3 Diarrhea 6 10 5 3 Depression 4 4 4 1 Headache 3 4 6 2 Anxiety 3 3 2 1 Anorexia/Decreased Appetite 3 9 9 2 Weight Decreased ** 3 8 5 1 Dizziness 2 7 7 2 Abdominal Pain 2 4 1 1 Urinary Tract Infection 2 2 1 1 Asthenia 2 3 6 1 Fatigue 2 2 1 1 Insomnia 1 4 2 2 Abdominal Pain Upper 1 3 2 2 Vertigo 0 2 1 1*Vomiting was severe in 0% of patients who received rivastigmine transdermal system 9.5 mg/24 hours, 1% of patients who received rivastigmine transdermal system 17.4 mg/24 hours, 1% of patients who received the rivastigmine capsule at doses up to 6 mg twice daily, and 0% of those who received placebo. **Weight Decreased as presented in Table 1 is based upon clinical observations and/or adverse events reported by patients or caregivers. Body weight was also monitored at prespecified time points throughout the course of the clinical study. The proportion of patients who had weight loss equal to or greater than 7% of their baseline weight was 8% of those treated with rivastigmine transdermal system 9.5 mg/24 hours, 12% of those treated with rivastigmine transdermal system 17.4 mg/24 hours, 11% of patients who received the rivastigmine capsule at doses up to 6 mg twice daily and 6% of those who received placebo. It is not clear how much of the weight loss was associated with anorexia, nausea, vomiting, and the diarrhea associated with the drug.48-Week International Active Comparator-Controlled Trial (Study 2)Most Common Adverse ReactionsIn Study 2 [see Clinical Studies (14)] of the commonly observed adverse reactions (greater than or equal to 3% in any treatment group), the most frequent event in the rivastigmine transdermal system 13.3 mg/24 hours group was nausea, followed by vomiting, fall, weight decreased, application site erythema, decreased appetite, diarrhea and urinary tract infection (Table 3). The percentage of patients with these events was higher in the rivastigmine transdermal system 13.3 mg/24 hours group than in the rivastigmine transdermal system 9.5 mg/24 hours group. Patients with nausea, vomiting, diarrhea and decreased appetite experienced these reactions more often during the first 4 weeks of the double-blind treatment phase. These reactions decreased over time in each treatment group. Weight decreased was reported to have increased over time in each treatment group.Discontinuation RatesTable 2 displays the most common adverse reactions leading to discontinuation during the 48-week double-blind treatment phase in Study 2.Table 2Proportion of Most Common ARs (Greater Than 1% at any dose) Leading to Discontinuation During 48-week Double-Blind (DB) Treatment Phase in Study 2 Rivastigmine Transdermal System 13.3 mg/24 hours Rivastigmine Transdermal System 9.5 mg/24 hours Total Total Patients Studied 280 283 563 Total Percentage of Patients with ARs Leading to Discontinuation (%) 9.6 12.7 11.2 Vomiting 1.4 0.4 0.9 Application site pruritus 1.1 1.1 1.1 Aggression 0.4 1.1 0.7Most Common Adverse Reactions Greater Than or Equal to 3%Other adverse reactions of interest which occurred less frequently, but which were observed in a markedly higher percentage of patients in the rivastigmine transdermal system 13.3 mg/24 hours group than in the rivastigmine transdermal system 9.5 mg/24 hours group in Study 2, included dizziness and upper abdominal pain. The percentage of patients with these reactions decreased over time in each treatment group (Table 3). 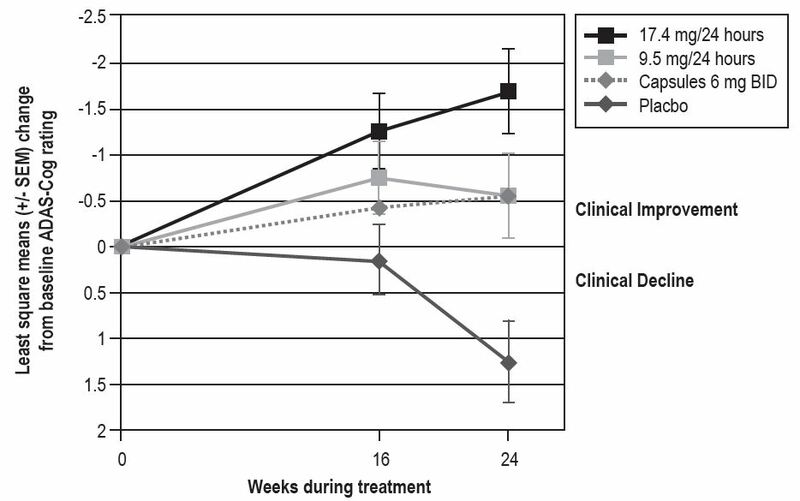 The adverse reaction severity profile was generally similar for both the rivastigmine transdermal system 13.3 mg/24 hours and 9.5 mg/24 hours groups.Table 3 Proportion of ARs Over Time in the 48-week DB-Treatment Phase (at Least 3% in any Treatment Group) in Study 2 Cumulative Week 0 to 48 (DB Phase) Week 0 to 24 (DB Phase) Week > 24 to 48 (DB Phase) Preferred Term Rivastigmine Transdermal System 13.3 mg/24 hours Rivastigmine Transdermal System 9.5 mg/24 hours Rivastigmine Transdermal System 13.3 mg/24 hours Rivastigmine Transdermal System 9.5 mg/24 hours Rivastigmine Transdermal System 13.3 mg/24 hours Rivastigmine Transdermal System 9.5 mg/24 hours Total Patients Studied 280 283 280 283 241 246 Total Percentage of Patients with ARs (%) 75 68 65 55 42 40 Nausea 12 5 10 4 4 2 Vomiting 10 5 9 3 3 2 Fall 8 6 4 4 4 3 Weight decreased* 7 3 3 1 5 2 Application site erythema 6 6 6 5 1 2 Decreased appetite 6 3 5 2 2 <1 Diarrhea 6 5 5 4 2 <1 Urinary tract infection 5 4 3 3 3 2 Agitation 5 5 4 3 1 2 Depression 5 5 3 3 3 2 Dizziness 4 1 3 <1 2 <1 Application site pruritus 4 4 4 3 <1 1 Headache 4 4 4 4 <1 <1 Insomnia 4 3 2 1 3 2 Abdominal pain upper 4 1 3 1 1 <1 Anxiety 4 3 2 2 2 1 Hypertension 3 3 3 2 1 1 Urinary incontinence 3 2 2 1 1 <1 Psychomotor hyperactivity 3 3 2 3 2 1 Aggression 2 3 1 3 1 1*Decreased Weight as presented in Table 3 is based upon clinical observations and/or adverse events reported by patients or caregivers. Body weight was monitored as a vital sign at pre-specified time points throughout the course of the clinical study. The proportion of patients who had weight loss equal to or greater than 7% of their baseline weight was 15.2% of those treated with rivastigmine transdermal system 9.5 mg/24 hours and 18.6% of those treated with rivastigmine transdermal system 13.3 mg/24 hours during the 48-week double-blind treatment periodSevere Alzheimer's Disease24-Week US Controlled Trial (Study 3)Most Commonly Observed Adverse ReactionsThe most common adverse reactions in patients administered rivastigmine transdermal system in the controlled clinical trial, defined as those occurring at a frequency of at least 5% in the 13.3 mg/24 hours rivastigmine transdermal system arm and at a frequency higher than in the 4.6 mg/24 hours rivastigmine transdermal system were application site erythema, fall, insomnia, vomiting, diarrhea, weight decreased, and nausea (Table 4). Patients in the lower dose group reported more events of agitation, urinary tract infection, and hallucinations than patients in the higher dose group.Discontinuation RatesIn Study 3 [see Clinical Studies (14)], the proportions of patients in the rivastigmine transdermal system 13.3 mg/24 hours (n=355) and rivastigmine transdermal system 4.6 mg/24 hours (n=359), who discontinued treatment due to adverse reactions were 21% and 14%, respectively.The most frequent adverse reaction leading to discontinuation in the 13.3 mg/24 hours treatment group versus the 4.6 mg/24 hours treatment group was agitation (2.8% versus 2.2%), followed by vomiting (2.5% and 1.1%), nausea (1.7% and 1.1%), decreased appetite (1.7% and 0%), aggression (1.1% and 0.3%), fall (1.1% and 0.3%) and syncope (1.1% and 0.3%). Otherwise, all AEs leading to discontinuation were reported in less than 1% of patients.Most Commonly Observed Adverse Reactions Greater than or Equal to 5%Other adverse reactions of interest, which were observed in a higher percentage of patients in the rivastigmine transdermal system 13.3 mg/24 hours group than in the rivastigmine transdermal system 4.6 mg/24 hours group, included application site erythema, fall, insomnia, vomiting, diarrhea, weight decreased, and nausea (Table 4). Overall, the majority of patients in this study experienced adverse reactions that were mild (30.7%) or moderate (32.1%) in severity. Slightly more patients in the 4.6 mg/24 hours transdermal system group reported mild events than in the 13.3 mg/24 hours transdermal system group, while the numbers of patients reporting moderate events were comparable between groups. Severe adverse reactions were reported at a slightly higher percentage at the higher dose (12.4%) than at the lower dose (10%) treatment groups. With the exception of severe adverse reactions of agitation (13.3 mg: 1.1%; 4.6 mg: 1.4%), fall (13.3 mg: 1.1%) and urinary tract infection (4.6 mg: 1.1%), all adverse reactions reported as severe occurred in less than 1% of patients in either treatment group.Table 4Proportion of ARs in the 24-week DB-Treatment Phase (at Least 5% in any Treatment Group) in Study 3 Preferred term Rivastigmine Transdermal System 13.3 mg/24 hours Rivastigmine Transdermal System 4.6 mg/24 hours Total number of patients studied 355 359 Total percentage of patients with ARs (%) 75 73 Application site erythema 13 12 Agitation 12 14 Urinary tract infection 8 10 Fall 8 6 Insomnia 7 4 Vomiting 7 3 Diarrhea 7 5 Weight decreased* 7 3 Nausea 6 3 Depression 5 4 Decreased appetite 5 1 Anxiety 5 5 Hallucination 2 5*Weight Decreased as presented in Table 4 is based upon clinical observations and/or adverse events reported by patients or caregivers. Body weight was monitored as a vital sign at prespecified time points throughout the course of the clinical study. The proportion of patients who had weight loss equal to or greater than 7% of their baseline weight was 11% of those treated with rivastigmine transdermal system 4.6 mg/24 hours and 14.1% of those treated with rivastigmine transdermal system 13.3 mg/24 hours during the 24-week double-blind treatment.Application Site ReactionsApplication site skin reactions leading to discontinuation were observed in less than or equal to 2.3% of rivastigmine transdermal system patients. This number was 4.9% and 8.4% in the Chinese population and Japanese population, respectively.Cases of skin irritation were captured separately on an investigator-rated skin irritation scale. Skin irritation, when observed, was mostly slight or mild in severity and was rated as severe in less than or equal to 2.2% of rivastigmine transdermal system patients in a double-blind controlled study and in less than or equal to 3.7% of rivastigmine transdermal system patients in a double-blind controlled study in Japanese patients.Parkinson's Disease Dementia76-week International Open-Label Trial (Study 4)Rivastigmine transdermal system has been administered to 288 patients with mild-to-moderate Parkinson's Disease Dementia in a single, 76-week, open-label, active-comparator safety study. Of these, 256 have been treated for at least 12 weeks, 232 for at least 24 weeks, and 196 for at least 52 weeks.Treatment with rivastigmine transdermal system was initiated at 4.6 mg/24 hours and if tolerated the dose was increased after 4 weeks to 9.5 mg/24 hours. Rivastigmine capsule (target maintenance dose of 12 mg/day) served as the active comparator and was administered to 294 patients. Adverse reactions are presented in Table 5.Table 5Proportion of ARs Reported at a Rate Greater Than or Equal to 2% During the Initial 24-Week Period in Study 4 Adverse Drug Reactions Rivastigmine Transdermal System Total patients studied 288 Percentage (%) Psychiatric Disorders Insomnia 6 Depression 6 Anxiety 5 Agitation 3 Nervous System Disorders Tremor 7 Dizziness 6 Somnolence 4 Hypokinesia 4 Bradykinesia 4 Cogwheel rigidity 3 Dyskinesia 3 Gastrointestinal Disorders Abdominal pain 2 Vascular Disorders Hypertension 3 General Disorders and Administration-site Conditions Fall 12 Application site erythema 11 Application site irritation, pruritus, rash 3,5,2 Fatigue 4 Asthenia 2 Gait disturbance 4Additional adverse reactions observed during the 76-week prospective, open-label study in patients with dementia associated with Parkinson's disease treated with rivastigmine transdermal system: Frequent (those occurring in at least 1/100 patients): dehydration, weight decreased, aggression, hallucination visual.In patients with dementia associated with Parkinson's disease, the following adverse drug reactions have only been observed in clinical trials with rivastigmine capsules: Frequent: nausea, vomiting, decreased appetite, restlessness, worsening of Parkinson's disease, bradycardia, diarrhea, dyspepsia, salivary hypersecretion, sweating increased; Infrequent (those occurring between 1/100 to 1/1000 patients): dystonia, atrial fibrillation, atrioventricular block. The following adverse reactions have been identified during post approval use of rivastigmine capsules, rivastigmine oral solution, or rivastigmine transdermal system. Because these reactions are reported voluntarily from a population of uncertain size, it is not always possible to reliably estimate their frequency or establish a causal relationship to drug exposure.Cardiac Disorders: Tachycardia.Hepatobiliary Disorders: Abnormal liver function tests, hepatitis.Nervous System Disorders: Parkinson's disease (worsening), seizure, tremor.Psychiatric Disorders: nightmares.Skin and Subcutaneous Tissue Disorders: Allergic dermatitis, application site hypersensitivity, blister, disseminated allergic dermatitis, Stevens-Johnson syndrome, urticaria.Vascular Disorders: Hypertension. Due to the risk of additive extra-pyramidal adverse reactions, the concomitant use of metoclopramide and rivastigmine transdermal system is not recommended. Rivastigmine transdermal system may increase the cholinergic effects of other cholinomimetic medications and may also interfere with the activity of anticholinergic medications (e.g., oxybutynin, tolterodine). Concomitant use of rivastigmine transdermal system with medications having these pharmacologic effects is not recommended unless deemed clinically necessary [see Warnings and Precautions (5.4)]. Additive bradycardic effects resulting in syncope may occur when rivastigmine is used concomitantly with beta-blockers, especially cardioselective beta-blockers (including atenolol). Concomitant use is not recommended when signs of bradycardia including syncope are present. Risk SummaryThere are no adequate data on the developmental risks associated with the use of rivastigmine in pregnant women. In animals, no adverse effects on embryo-fetal development were observed at oral doses 2-4 times the maximum recommended human dose (MRHD) (see Data).The background risk of major birth defects and miscarriage for the indicated population is unknown. In the U.S. general population, the estimated background risk of major birth defects and miscarriage in clinically recognized pregnancies is 2%-4% and 15%-20%, respectively.DataAnimal DataOral administration of rivastigmine to pregnant rats and rabbits throughout organogenesis produced no adverse effects on embryo-fetal development up to the highest dose tested (2.3 mg/kg/day), which is 2 and 4 times, respectively, the MRHD of 12 mg per day on a body surface area (mg/m2) basis. Risk SummaryThere are no data on the presence of rivastigmine in human milk, the effects on the breastfed infant, or the effects of rivastigmine on milk production. Rivastigmine and its metabolites are excreted in rat milk following oral administration of rivastigmine; levels of rivastigmine plus metabolites in rat milk are approximately 2 times that in maternal plasma.The developmental and health benefits of breastfeeding should be considered along with the mother's clinical need for rivastigmine and any potential adverse effects on the breastfed infant from rivastigmine or from the underlying maternal condition. Safety and effectiveness in pediatric patients have not been established. The use of rivastigmine transdermal system in pediatric patients (below 18 years of age) is not recommended. Of the total number of patients in clinical studies of rivastigmine transdermal system, 88% were 65 years and over, while 55% were 75 years. No overall differences in safety or effectiveness were observed between these patients and younger patients, and other reported clinical experience has not identified differences in responses between the elderly and younger patients, but greater sensitivity of some older individuals cannot be ruled out. Increased exposure to rivastigmine was observed in patients with mild or moderate hepatic impairment with oral rivastigmine. Patients with mild or moderate hepatic impairment may be able to only tolerate lower doses [see Dosage and Administration (2.2), Clinical Pharmacology (12.3)]. No data are available on the use of rivastigmine in patients with severe hepatic impairment. Because rivastigmine blood levels vary with weight, careful titration and monitoring should be performed in patients with low or high body weights [see Dosage and Administration (2.2), Clinical Pharmacology (12.3)]. Overdose with rivastigmine transdermal system has been reported in the postmarketing setting [see Warnings and Precautions (5.1)]. Overdoses have occurred from application of more than one transdermal system at one time and not removing the previous day's transdermal system before applying a new transdermal system. The symptoms reported in these overdose cases are similar to those seen in cases of overdose associated with rivastigmine oral formulations.Because strategies for the management of overdose are continually evolving, it is advisable to contact a Poison Control Center to determine the latest recommendations for the management of an overdose of any drug. As rivastigmine has a plasma half-life of about 3.4 hours after transdermal system administration and a duration of acetylcholinesterase inhibition of about 9 hours, it is recommended that in cases of asymptomatic overdose the transdermal system should be immediately removed and no further transdermal system should be applied for the next 24 hours.As in any case of overdose, general supportive measures should be utilized.Overdosage with cholinesterase inhibitors can result in cholinergic crisis characterized by severe nausea, vomiting, salivation, sweating, bradycardia, hypotension, respiratory depression, and convulsions. Increasing muscle weakness is a possibility and may result in death if respiratory muscles are involved. Atypical responses in blood pressure and heart rate have been reported with other drugs that increase cholinergic activity when coadministered with quaternary anticholinergics such as glycopyrrolate. Additional symptoms associated with rivastigmine overdose are diarrhea, abdominal pain, dizziness, tremor, headache, somnolence, confusional state, hyperhidrosis, hypertension, hallucinations and malaise. Due to the short plasma elimination half-life of rivastigmine after transdermal system administration, dialysis (hemodialysis, peritoneal dialysis, or hemofiltration) would not be clinically indicated in the event of an overdose.In overdose accompanied by severe nausea and vomiting, the use of antiemetics should be considered. A fatal outcome has rarely been reported with rivastigmine overdose. Rivastigmine transdermal system contains rivastigmine USP, a reversible cholinesterase inhibitor known chemically as (S)-3-[1-(dimethylamino)ethyl]phenyl ethylmethylcarbamate. It has an empirical formula of C14H22N2O2 as the base and a molecular weight of 250.34 g/mol (as the base). Rivastigmine is a viscous, clear, and colorless to yellow to very slightly brown liquid that is sparingly soluble in water and very soluble in ethanol, acetonitrile, n-octanol and ethyl acetate.The distribution coefficient at 37°C in n-octanol/phosphate buffer solution pH 7 is 4.27.Rivastigmine transdermal system is for transdermal administration. 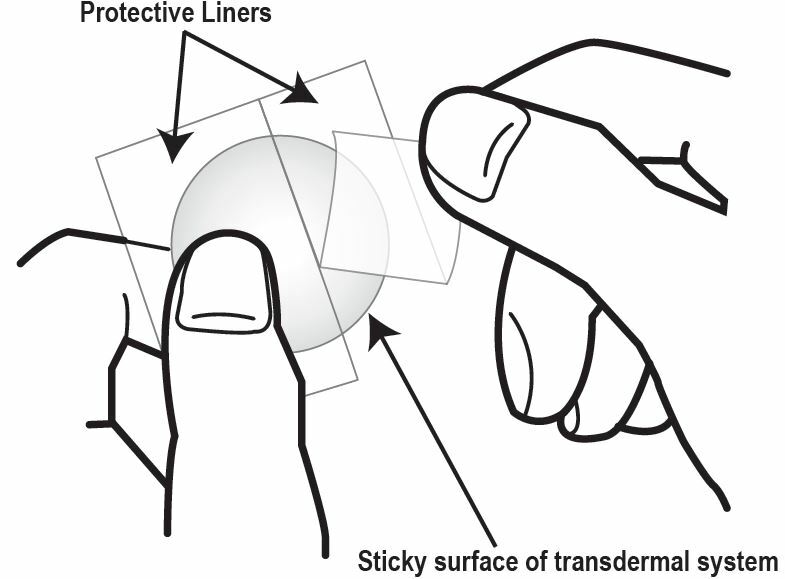 The transdermal system is a four-layer laminate containing (1) a foam backing with adhesive layer, (2) a polyester film, (3) an adhesive matrix containing rivastigmine, and (4) a fluoropolymer coated polyester release liner (see Figure 1). 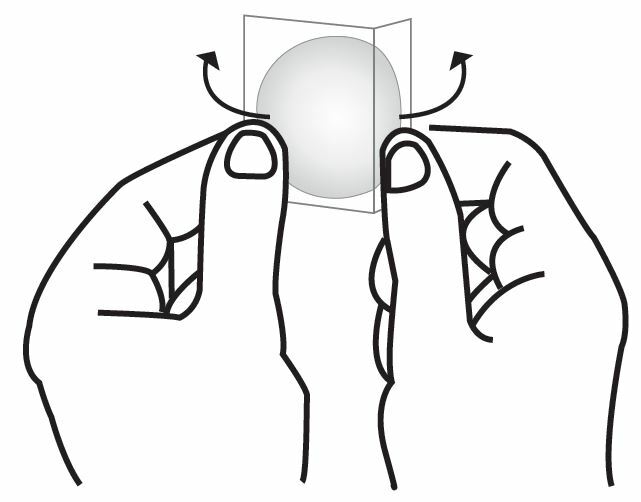 The release liner is removed and discarded prior to use.Figure 1: Cross Section of the Rivastigmine Transdermal SystemLayer 1: Copolymer foam backing with adhesive layerLayer 2: Polyester FilmLayer 3: Adhesive MatrixLayer 4: Fluoropolymer coated Release Liner (removed at time of use)The active component of the system is rivastigmine. The remaining components of the system (colloidal silicon dioxide, light mineral oil, polyisobutylene adhesive, copolymer foam and polyester film) are pharmacologically inactive. Additionally, rivastigmine transdermal system is printed with pharmaceutical grade brown ink which contains acrylic polymers, carbon black, ethoxylated 2,4,7,9-tetramethyl 5 decyn-4,7-diol, iron oxide, octylphenoxypolyethoxyethanol, polyethylene glycol, polyethylene wax and polytetrafluoroethylene. Although the precise mechanism of action of rivastigmine is unknown, it is thought to exert its therapeutic effect by enhancing cholinergic function. This is accomplished by increasing the concentration of acetylcholine through reversible inhibition of its hydrolysis by cholinesterase. The effect of rivastigmine may lessen as the disease process advances and fewer cholinergic neurons remain functionally intact. There is no evidence that rivastigmine alters the course of the underlying dementing process. 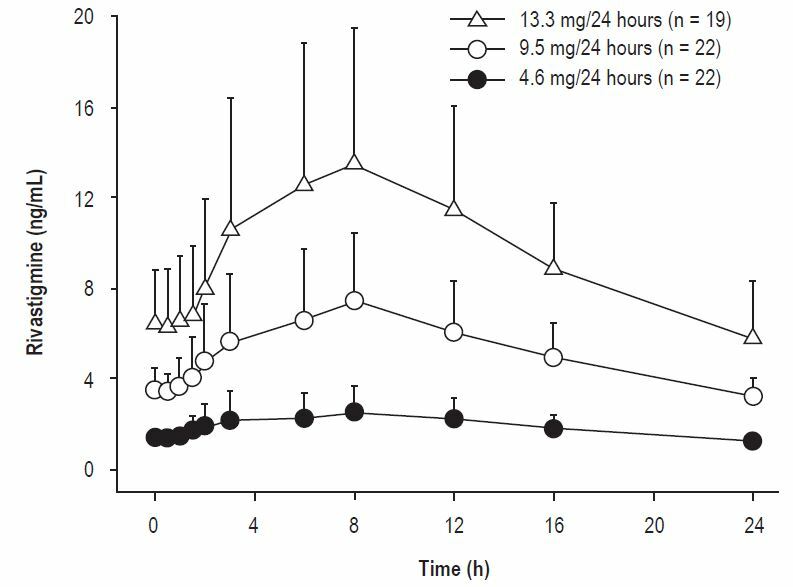 After a 6-mg oral dose of rivastigmine in humans, anticholinesterase activity is present in cerebrospinal fluid for about 10 hours, with a maximum inhibition of about 60% 5 hours after dosing.In vitro and in vivo studies demonstrate that the inhibition of cholinesterase by rivastigmine is not affected by the concomitant administration of memantine, an N-methyl-D-aspartate receptor antagonist. AbsorptionAfter the initial application of rivastigmine transdermal system, there is a lag time of 0.5 to 1 hour in the absorption of rivastigmine. Concentrations then rise slowly typically reaching a maximum after 8 hours, although maximum values (Cmax) can also occur later (at 10 to 16 hours). After the peak, plasma concentrations slowly decrease over the remainder of the 24-hour period of application. At steady state, trough levels are approximately 60% to 80% of peak levels.Rivastigmine transdermal system 9.5 mg/24 hours gave exposure approximately the same as that provided by an oral dose of 6 mg twice daily (i.e., 12 mg/day). 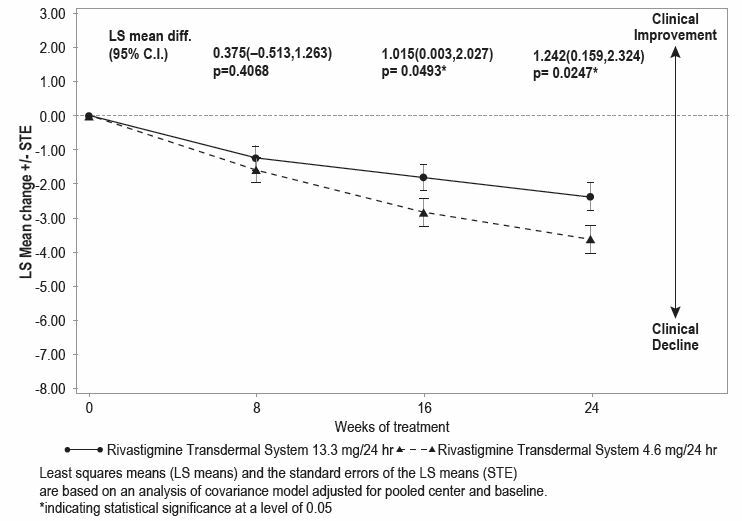 Inter-subject variability in exposure was lower (43% to 49%) for the rivastigmine transdermal system formulation as compared with the oral formulations (73% to 103%). Fluctuation (between Cmax and Cmin) is less for rivastigmine transdermal system than for the oral formulation of rivastigmine.Figure 2 displays rivastigmine plasma concentrations over 24 hours for the 3 available transdermal system strengths.Figure 2Rivastigmine Plasma Concentrations Following Dermal 24-Hour Transdermal System ApplicationOver a 24-hour dermal application, approximately 50% of the drug content of the transdermal system is released from the system.Exposure area under the plasma concentration-time curve from time zero to infinity (AUC∞) to rivastigmine (and metabolite NAP266-90) was highest when the transdermal system was applied to the upper back, chest, or upper arm. Two other sites (abdomen and thigh) could be used if none of the 3 other sites is available, but the practitioner should be aware that the rivastigmine plasma exposure associated with these sites was approximately 20% to 30% lower.There was no relevant accumulation of rivastigmine or the metabolite NAP226-90 in plasma in patients with Alzheimer's disease with daily dosing.The pharmacokinetic profile of rivastigmine transdermal systems was comparable in patients with Alzheimer's disease and in patients with dementia associated with Parkinson's disease.DistributionRivastigmine is weakly bound to plasma proteins (approximately 40%) over the therapeutic range. It readily crosses the blood-brain barrier, reaching CSF peak concentrations in 1.4 to 2.6 hours. It has an apparent volume of distribution in the range of 1.8 to 2.7 L/kg.MetabolismRivastigmine is extensively metabolized primarily via cholinesterase-mediated hydrolysis to the decarbamylated metabolite NAP226-90. In vitro, this metabolite shows minimal inhibition of acetylcholinesterase (less than 10%). Based on evidence from in vitro and animal studies, the major cytochrome P450 isoenzymes are minimally involved in rivastigmine metabolism.The metabolite-to-parent AUC∞ ratio was about 0.7 after rivastigmine transdermal system application versus 3.5 after oral administration, indicating that much less metabolism occurred after dermal treatment. Less NAP226-90 is formed following transdermal system application, presumably because of the lack of presystemic (hepatic first pass) metabolism. Based on in vitro studies, no unique metabolic routes were detected in human skin.EliminationRenal excretion of the metabolites is the major route of elimination. Unchanged rivastigmine is found in trace amounts in the urine. Following administration of 14C-rivastigmine, renal elimination was rapid and essentially complete (greater than 90%) within 24 hours. Less than 1% of the administered dose is excreted in the feces. The apparent elimination half-life in plasma is approximately 3 hours after transdermal system removal. Renal clearance was approximately 2.1 to 2.8 L/hr.AgeAge had no impact on the exposure to rivastigmine in Alzheimer's disease patients treated with rivastigmine transdermal system.Gender and RaceNo specific pharmacokinetic study was conducted to investigate the effect of gender and race on the disposition of rivastigmine transdermal system. A population pharmacokinetic analysis of oral rivastigmine indicated that neither gender (n=277 males and 348 females) nor race (n=575 Caucasian, 34 Black, 4 Asian, and 12 Other) affected clearance of the drug.Similar results were seen with analyses of pharmacokinetic data obtained after the administration of rivastigmine transdermal system.Body WeightA relationship between drug exposure at steady state (rivastigmine and metabolite NAP226-90) and body weight was observed in Alzheimer's dementia patients. Rivastigmine exposure is higher in subjects with low body weight. Compared to a patient with a body weight of 65 kg, the rivastigmine steady-state concentrations in a patient with a body weight of 35 kg would be approximately doubled, while for a patient with a body weight of 100 kg the concentrations would be approximately halved [see Dosage and Administration (2.2)].Renal ImpairmentNo study was conducted with rivastigmine transdermal system in subjects with renal impairment. Based on population analysis, creatinine clearance did not show any clear effect on steady state concentrations of rivastigmine or its metabolite.Hepatic ImpairmentNo pharmacokinetic study was conducted with rivastigmine transdermal system in subjects with hepatic impairment. Following a single 3-mg dose, mean oral clearance of rivastigmine was 60% lower in hepatically impaired patients (n=10, biopsy proven) than in healthy subjects (n=10). After multiple 6-mg twice a day oral dosing, the mean clearance of rivastigmine was 65% lower in mild (n=7, Child-Pugh score 5 to 6) and moderate (n=3, Child-Pugh score 7 to 9) hepatically impaired patients (biopsy proven, liver cirrhosis) than in healthy subjects (n=10) [see Dosage and Administration (2.2), Use in Specific Populations (8.6)].SmokingFollowing oral rivastigmine administration (up to 12 mg/day) with nicotine use, population pharmacokinetic analysis showed increased oral clearance of rivastigmine by 23% (n=75 smokers and 549 nonsmokers).Drug Interaction StudiesNo specific interaction studies have been conducted with rivastigmine transdermal system. Information presented below is from studies with oral rivastigmine.Effect of Rivastigmine on the Metabolism of Other DrugsRivastigmine is primarily metabolized through hydrolysis by esterases. Minimal metabolism occurs via the major cytochrome P450 isoenzymes. Based on in vitro studies, no pharmacokinetic drug interactions with drugs metabolized by the following isoenzyme systems are expected: CYP1A2, CYP2D6, CYP3A4/5, CYP2E1, CYP2C9, CYP2C8, CYP2C19, or CYP2B6.No pharmacokinetic interaction was observed between rivastigmine taken orally and digoxin, warfarin, diazepam, or fluoxetine in studies in healthy volunteers. The increase in prothrombin time induced by warfarin is not affected by administration of rivastigmine.Effect of Other Drugs on the Metabolism of RivastigmineDrugs that induce or inhibit CYP450 metabolism are not expected to alter the metabolism of rivastigmine.Population pharmacokinetic analysis with a database of 625 patients showed that the pharmacokinetics of rivastigmine taken orally were not influenced by commonly prescribed medications such as antacids (n=77), antihypertensives (n=72), beta-blockers (n=42), calcium channel blockers (n=75), antidiabetics (n=21), nonsteroidal anti-inflammatory drugs (n=79), estrogens (n=70), salicylate analgesics (n=177), antianginals (n=35), and antihistamines (n=15). CarcinogenesisIn oral carcinogenicity studies conducted at doses up to 1.1 mg/kg/day in rats and 1.6 mg/kg/day in mice, rivastigmine was not carcinogenic.In a dermal carcinogenicity study conducted at doses up to 0.75 mg base/kg/day in mice, rivastigmine was not carcinogenic. The mean rivastigmine plasma exposure (AUC) at this dose was less than that in humans at the maximum recommended human dose (13.3 mg/24 hours).MutagenesisRivastigmine was clastogenic in in vitro chromosomal aberration assays in mammalian cells in the presence, but not the absence, of metabolic activation. Rivastigmine was negative in an in vitro bacterial reverse mutation (Ames) assay, an in vitro HGPRT assay, and in an in vivo mouse micronucleus test.Impairment of FertilityNo fertility or reproduction studies of dermal rivastigmine have been conducted in animals. Rivastigmine had no effect on fertility or reproductive performance in rats at oral doses up to 1.1 mg/kg/day. Rivastigmine Transdermal System: 4.6 mg/24 hoursEach transdermal system of 7.75cm2contains 6.975 mg rivastigmine USP with in vivo release rate of 4.6 mg/24 hours.Carton of 30………………………NDC 70710-1196-7Rivastigmine Transdermal System: 9.5 mg/24 hoursEach transdermal system of 16cm2 contains 14.4 mg rivastigmine USP with in vivo release rate of 9.5 mg/24 hours.Carton of 30………………………..NDC 70710-1197-7Rivastigmine Transdermal System: 13.3 mg/24 hoursEach transdermal system of 22.4cm2 contains 20.16 mg rivastigmine USP with in vivo release rate of 13.3 mg/24 hours.Carton of 30………………………..NDC 70710-1198-7Store at 20° to 25°C (68° to 77°F) [See USP Controlled Room Temperature].Keep rivastigmine transdermal system in the individual sealed pouch until use. Each pouch contains 1 transdermal system. Used systems should be folded, with the adhesive surfaces pressed together, and discarded safely. Rivastigmine Transdermal System (Riv-ah-stig-meen ) What is the most important information I should know about Rivastigmine Transdermal System? Rivastigmine transdermal system is for skin use only. What is rivastigmine transdermal system? Rivastigmine transdermal system is a prescription medicine used to treat: ● Mild, moderate, and severe memory problems (dementia) associated with Alzheimer's disease. ● Mild-to-moderate memory problems (dementia) associated with Parkinson's disease (PD). Based on clinical trials conducted over 6 to 12 months rivastigmine transdermal system was shown to help with cognition which includes (memory, understanding communication, and reasoning) and with doing daily tasks. Rivastigmine transdermal system does not work the same in all people. Some people treated with rivastigmine transdermal system may: ● Seem much better ● Get better in small ways or stay the same ● Get worse but slower than expected ● Not change and then get worse as expected Some patients will not benefit from treatment with rivastigmine transdermal system. Rivastigmine transdermal system does not cure Alzheimer's disease. All patients with Alzheimer's disease get worse over time. Rivastigmine transdermal system comes as a transdermal system that delivers rivastigmine (the medicine in rivastigmine transdermal system) through the skin. It is not known if rivastigmine transdermal system is safe or effective in children under 18 years of age. Who should not use rivastigmine transdermal system? Do not use rivastigmine transdermal system if you: ● are allergic to rivastigmine, carbamate derivatives, or any of the ingredients in rivastigmine transdermal system. See the end of this leaflet for a complete list of ingredients in rivastigmine transdermal system. ● have had a skin reaction that: ○ spread beyond the rivastigmine transdermal system size ○ had blisters, increased skin redness, or swelling ○ did not get better within 48 hours after you removed the rivastigmine transdermal system Ask your healthcare provider if you are not sure if you should use rivastigmine transdermal system. What should I tell my healthcare provider before using rivastigmine transdermal system? Before you use rivastigmine transdermal system, tell your healthcare provider if you: ● have or have had a stomach ulcer ● are planning to have surgery ● have or have had problems with your heart ● have problems passing urine ● have or have had seizures ● have problems with movement (tremors) ● have asthma or breathing problems ● have a loss of appetite or are losing weight ● have had a skin reaction to rivastigmine (the medicine in rivastigmine transdermal system) in the past ● have any other medical conditions ● are pregnant or plan to become pregnant. It is not known if the medicine in rivastigmine transdermal system will harm your unborn baby. Talk to your healthcare provider if you are pregnant or plan to become pregnant. ● are breastfeeding or plan to breastfeed. It is not known if the medicine in rivastigmine transdermal system passes into your breast milk. Talk to your doctor about the best way to feed your baby if you take rivastigmine transdermal system. Tell your healthcare provider about all the medicines you take, including prescription and over-the-counter medicines, vitamins, and herbal supplements. Especially tell your healthcare provider if you take: ● a medicine used to treat inflammation [nonsteroidal anti-inflammatory drugs (NSAIDs)] ● other medicines used to treat Alzheimer's or Parkinson's disease ● an anticholinergic medicine, such as an allergy or cold medicine, a medicine to treat bladder or bowel spasms, or certain asthma medicines, or certain medicines to prevent motion or travel sickness ● metoclopramide, a drug given to relieve symptoms of nausea, gastroesophageal reflux disease(GERD), or nausea and vomiting after surgery or chemotherapy treatment ● If you are undergoing surgery while using rivastigmine transdermal system, inform your doctor because rivastigmine transdermal system may exaggerate the effects of anesthesia, or the effects of a beta-blocker, a type of medicine given for high blood pressure, heart disease, and other medical conditions Ask your healthcare provider if you are not sure if your medicine is one listed above. Know the medicines you take. Keep a list of them to show to your healthcare provider and pharmacist when you get a new medicine. How should I use rivastigmine transdermal system? ● Use rivastigmine transdermal system exactly as your healthcare provider tells you to use it. ● Rivastigmine transdermal system comes in 3 different dosage strengths. ● Your healthcare provider may change your dose as needed. ● Wear only 1 rivastigmine transdermal system at a time. ● Rivastigmine transdermal system is for skin use only. ● Only apply rivastigmine transdermal system to healthy skin that is clean, dry, hairless, and free of redness, irritation, burns or cuts. ● Avoid applying rivastigmine transdermal system to areas on your body that will be rubbed against tight clothing. 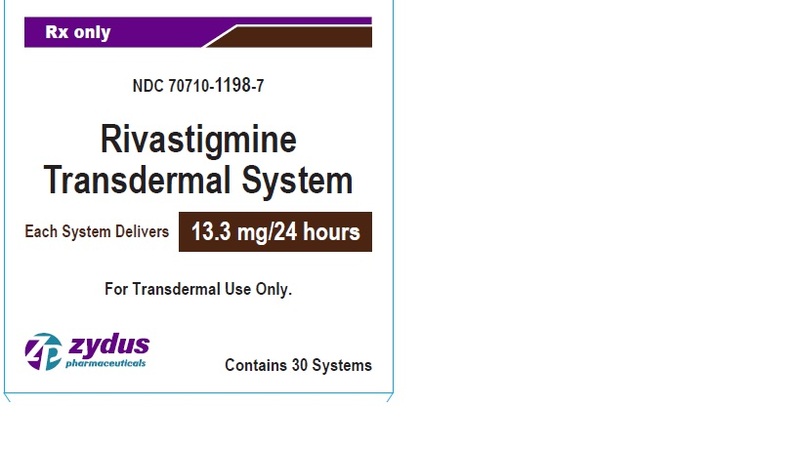 ● Do not apply rivastigmine transdermal system to skin that has cream, lotion, or powder on it. ● Change your rivastigmine transdermal system every 24 hours at the same time of day. You may write the date and time you put on the rivastigmine transdermal system with a ballpoint pen before applying the transdermal system to help you remember when to remove it. ● Change your application site every day to avoid skin irritation. You can use the same area, but do not use the exact same spot for at least 14 days after your last application. ● Check to see if the rivastigmine transdermal system has become loose when you are bathing, swimming, or showering. ● Rivastigmine transdermal system is designed to deliver medication during the time it is worn. If your rivastigmine transdermal system falls off before its usual replacement time, put on a new rivastigmine transdermal system right away. Replace the new transdermal system the next day at the same time as usual. Do not use overlays, bandages, or tape to secure a rivastigmine transdermal system that has become loose or try to reapply a rivastigmine transdermal system that has fallen off. ● If you miss a dose or forget to change your rivastigmine transdermal system apply your next rivastigmine transdermal system as soon as you remember. Do not apply 2 rivastigmine transdermal systems to make up for the missed dose. ● If you miss more than 3 doses of applying rivastigmine transdermal system, call your healthcare provider before putting on a new rivastigmine transdermal system. You may need to restart rivastigmine transdermal system at a lower dose. ● Always remove the old rivastigmine transdermal system from the previous day before you apply a new one. ● Having more than 1 rivastigmine transdermal system on your body at the same time can cause you to get too much medicine. If you accidentally use more than 1 rivastigmine transdermal system at a time, call your healthcare provider right away. If you are unable to reach your healthcare provider, call your local Poison Control Center at 1-800-222-1222 or go to the nearest hospital emergency room right away. What should I avoid while using rivastigmine transdermal system? ● Do not touch your eyes after you touch the rivastigmine transdermal system. In case of accidental contact with your eyes or if your eyes become red after handling the transdermal system, rinse immediately with plenty of water and seek medical advice if symptoms do not resolve. 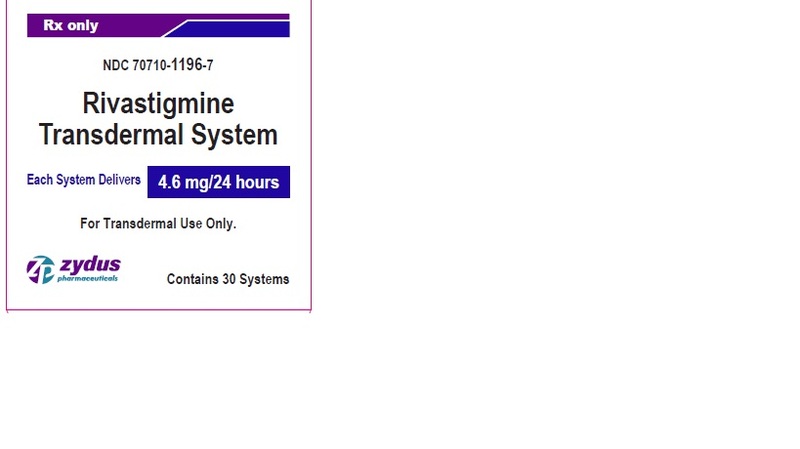 ● Rivastigmine transdermal system can cause drowsiness, dizziness, weakness, or fainting. Do not drive, operate heavy machinery, or do other dangerous activities until you know how rivastigmine transdermal system affects you. ● Avoid exposure to heat sources such as excessive sunlight, saunas, or sunrooms for long periods of time. What are the possible side effects of rivastigmine transdermal system? Rivastigmine transdermal system may cause serious side effects, including: ● Medication overdose . Hospitalization and rarely death may happen when people accidently wear more than 1 transdermal system at the same time. It is important that the old rivastigmine transdermal system be removed before you apply a new one. Do not wear more than 1 rivastigmine transdermal system at a time. ● Stomach or bowel (intestinal) problems, including : ○ nausea ○ vomiting ○ diarrhea ○ dehydration ○ loss of appetite ○ weight loss ○ bleeding in your stomach (ulcers) ● Skin reactions . Some people have had a serious skin reaction called allergic contact dermatitis (ACD) when using rivastigmine transdermal system. Stop using rivastigmine transdermal system and call your healthcare provider right away if you experience reactions that spread beyond the transdermal system size, are intense in nature and do not improve within 48 hours after the transdermal system is removed. Symptoms of ACD may be intense and include: ○ itching, redness, swelling, warmth or tenderness of the skin ○ peeling or blistering of the skin that may ooze, drain or crust over ● Heart problems ● Seizures ● Problems with movement (tremors) The most common side effects of rivastigmine transdermal systeminclude: ○ depression ○ headache ○ anxiety ○ dizziness ○ stomach pain ○ urinary tract infections ○ muscle weakness ○ tiredness ○ trouble sleeping Tell your healthcare provider if you have any side effect that bothers you or that does not go away. These are not all the possible side effects of rivastigmine transdermal system. For more information, ask your healthcare provider or pharmacist. Call your doctor for medical advice about side effects. You may report side effects to the FDA at 1-800-FDA-1088. How should I store rivastigmine transdermal system? ○ Store rivastigmine transdermal system between 68ºF to 77ºF (20ºC to 25ºC). ○ Keep rivastigmine transdermal system in the sealed pouch until ready to use. Keep rivastigmine transdermal system and all medicines out of the reach of children . General information about the safe and effective use of rivastigmine transdermal system . Medicines are sometimes prescribed for purposes other than those listed in the Patient Information leaflet. Do not use rivastigmine transdermal system for a condition for which it was not prescribed. Do not give rivastigmine transdermal system to other people, even if they have the same symptoms you have. It may harm them. This Patient Information leaflet summarizes the most important information about rivastigmine transdermal system. If you would like more information, talk with your healthcare provider. You can ask your pharmacist or healthcare provider for information about rivastigmine transdermal system that is written for health professionals. For more information, go to www.zydususa.com or call 1-877-993-8779. What are the ingredients of rivastigmine transdermal system? Active ingredient: rivastigmine USP Excipients include : colloidal silicon dioxide, light mineral oil, polyisobutylene adhesive, copolymer foam and polyester film. Additionally, rivastigmine transdermal system is printed with pharmaceutical grade brown ink which contains acrylic polymers, carbon black, ethoxylated 2,4,7,9-tetramethyl 5 decyn-4,7-diol, iron oxide, octylphenoxypolyethoxyethanol, polyethylene glycol, polyethylene wax and polytetrafluoroethylene.